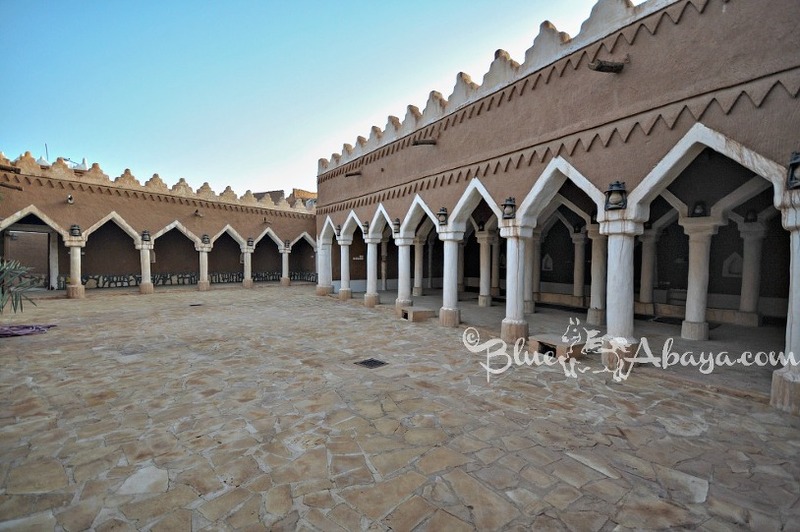 The following is a guide to the restored Saudi Arabian heritage village of Ushaiger (the town also called “The Little Blonde”) located outside Riyadh. The beautiful town of Ushaiger is the perfect destination for taking a day trip out from Riyadh, just an hour and a half drive away. Visiting this architectural treasure of the Najd region is an ideal way to experience how the everyday life was in Saudi Arabia few hundred years ago and a great chance learn about the Kingdom’s history. The Ushaiger mud village offers plenty of sightseeing opportunities and activities for the whole family. There’s a museum, a visitor’s center with opportunity to hire a tourist guide, a marketplace, mosques, and a restaurant. You will find the directions, GPS co-ordinates and location of Ushaiger village added at the end of the article. 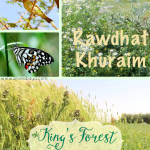 Check out Blue abaya’s guide to Raghbah mud village located closeby to Ushaiger, it’s possible to visit both these villages on the same trip! Ushaiger village is located approximately 180km NW out of Riyadh and is one of the oldest mud villages in the Najd region. What makes Ushaiger special is the fact that some of the local families treasured their heritage so much they decided to renovate some buildings and parts of the town back to its old glory. And all this from their own pockets! Ushaiger, which means “the little blonde”, was named after the red mountain that stands next to it. The first inhabitants settled here around 1500 years ago and the village served as a common stopping point for pilgrims going for Hajj. 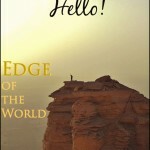 Visiting Ushaiger is well worth the approximately one and a half hour drive from Riyadh. The entire day can easily surpass by wandering around the narrow streets and seemingly endless alleyways. 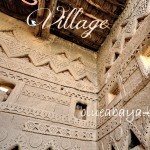 In addition to the myriad of different types of mud houses, the village has two schools, a marketplace, a museum, a heritage house and many picturesque mosques, some of which are still in use. Ushaiger is surrounded by an oasis and ancient farmlands which the inhabitants utilized by creating a complex irrigation and water collection system. The aim was to preserve and distribute the precious water derived from one of the many interconnected wells around the village. The people of Ushaiger are known to be very friendly and here you can experience the famous Saudi hospitality at its best. The locals can regularly be seen sitting on benches chatting and reading newspapers. The villagers are always willing to help visitors and show them around their much adored little town. Visitors will often be invited into one of the renovated mud houses for Arabic coffee and dates or if you’re lucky and they have time, guests are welcomed to join in on the family dinner. The interiors of these mud and straw houses are astonishing in detail and architecture; here one truly gets the feel of stepping back in time. Natural light enters the houses from the open air roofs and the many triangular windows distinctive to the Najdi style. Antique lanterns and traditional fireplaces further create a mysterious atmosphere inside the humble homes of the Ushaiger people. Take time to browse the museum which the villagers have set up from various artifacts and old relics collected from the inhabitants. The museum keepers will be more than happy to guide you around and explain in detail the history of each item. They have a superb collection of traditional clothing including old abayas which are surprisingly colorful and intricate in detail. There’s a small outdoor restaurant near the entrance overlooking the palm tree oasis which makes for a nice ending to the day. It’s recommended to drive up the nearby mountain for magnificent views down to the village. Ushaiger village is peaceful, beautiful and serene and makes for a humbling and enlightening experience. 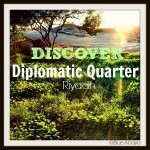 Share the love for Saudi Arabian culture and heritage by sharing this post with your friends! 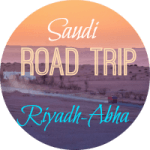 From Riyadh, Take Mekkah Road (route 40) out of Riyadh, pass the first checkpoint, go down the escarpment and turn right at the first exit, direction Shaqra (Highway 505). Drive on that highway for a some while, passing by Dhurma, Marat and Tharmda. When you reach the city of Shagra, continue on the route 505 passing by the city until you get to the turn signposted Ushaiger, turn right on this road. At the end of the road turn left and a sign for Ushaiger Heritage village will soon appear on the right side of the road. You can drive inside the village and park on the roads there, or leave the car outside of the main large gates and walk in. The village is always open to walk around and free to enter. The main museum is open from daily from 8 am. On Fridays they close for Dhuhr prayer and open again right after at around 1 pm depending on the time of prayer. It closes for the day at Ishaa prayer. Museum ticket 10 sar. The other heritage house museums are mostly open by request only, call the numbers on the signs you see on the houses and someone should come come to let you in. The restaurant opens for lunch at 1 pm on Fridays. They offer traditional Saudi foods cooked by local villagers. Everything we tried was very good. You pay by the weight of your plate which can make the end price a bit high. The village is getting very popular now with visitors and tourists on weekends. From when I first visited in 2012, and before I wrote this guide, the village was a sleepy and quite one, villagers would sit and drink coffee and freely invite people to their houses ( because there was a very rarely a foreign visitor there). I found on my last visit in April 2018 the village to be bustling with visitors and large tour buses were there as well. So it has lost some of that original charm, but still worth a visit. we have a farm there I’m from Shaqra. Hi. Been frequenting your blog since I came across it while searching for some information about Al Heet Cave. I’m just happy to share a similar story on the Ushaiger heritage village. Masha’Allah. This is beautiful and indeed one of the must go places. Layla, you have been my travel guide for some time now. Thanks for that. I am looking for some details about Hail for a trip of 3-4 days. Can you help with some places in and around Hail. Hello! It looks great! Is it possible to get there by public transport (bus)? Or do I have to také a taxi?